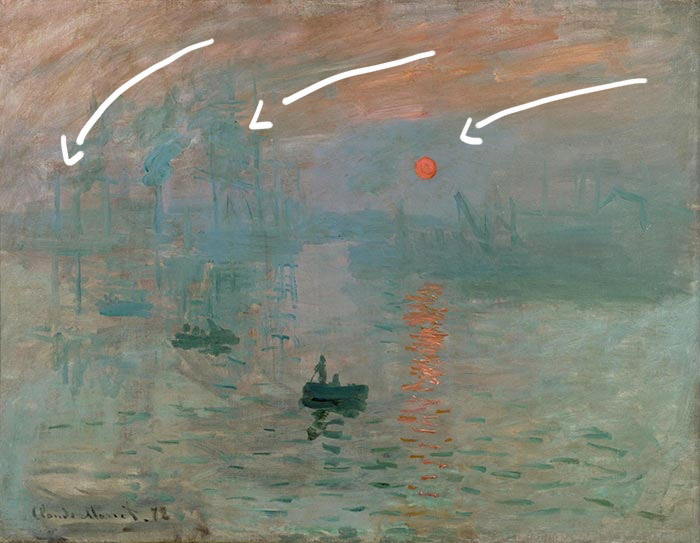 In this post I take a closer look at one of my favorite paintings, Impression, Sunrise by Claude Monet - the painting which gave Impressionism its name. 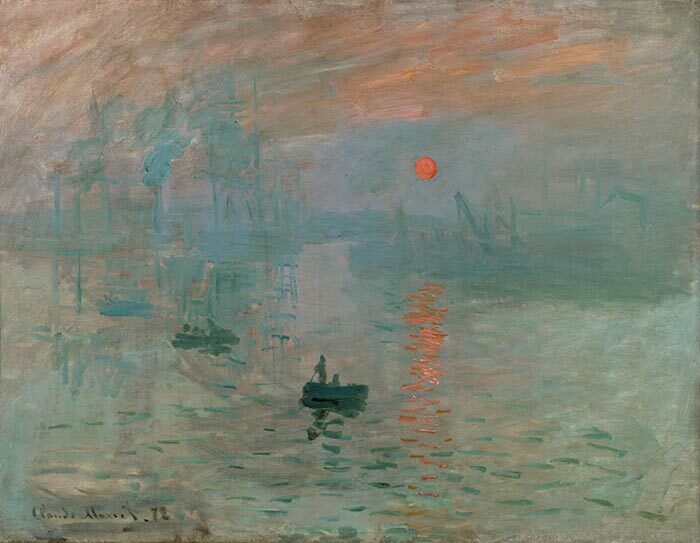 Impression, Sunrise was painted in 1872, when Monet was 32. The series was exhibited in 1874 at the "Exhibition of the Impressionists". Some of the other artists who exhibited alongside Monet were Camille Pissarro, Alfred Sisley, Paul Cézanne, Berthe Morisot and Edgar Degas. "Impression I was certain of it. I was just telling myself that, since I was impressed, there had to be some impression in it — and what freedom, what ease of workmanship! A preliminary drawing for a wallpaper pattern is more finished than this seascape." "They asked me for a title for the catalogue, it couldn't really be taken for a view of Le Havre, and I said: 'Put Impression.'" The focus of this painting is almost entirely on color and light. The brushwork is loose, the detail is simple and the composition is fairly basic. But the use of color to depict light is enough to make this painting work. 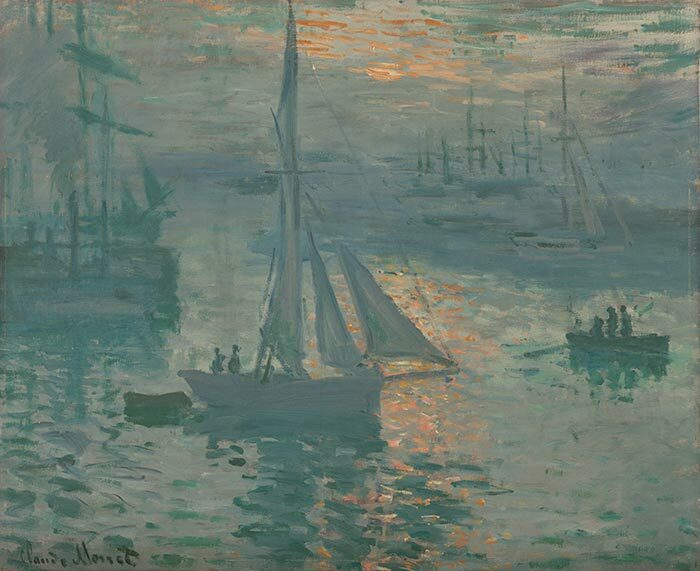 Most of the painting is made up of dull oranges, blues and greens, which form the backdrop for the dark green boats and the vivid orange sunrise. In my opinion, the most interesting part of the painting is the use of vivid orange to paint light. The sun and its reflection really jump out from the rest of the dull tones. Before you continue reading, have a think about how light or dark the orange sunrise and its reflection are compared to the surrounding colors. The answer is they are almost the exact same value, as revealed by the grayscale image below. There is basically no value contrast, only saturation and hue contrast. The dark boat, on the other hand, represents a strong value contrast from the surrounding colors. Whenever we are painting an actual light source (like the sun, a lamp or street light), a dilemma we face as artists is that our paints are not able to hit the same intensity of light itself. The other dilemma, especially for painting a warm light source like the sun, is that our colors tend to get weaker and cooler with the addition of white. What Monet shows with this painting is just how powerful saturation contrast can be, particularly for painting a warm light source. 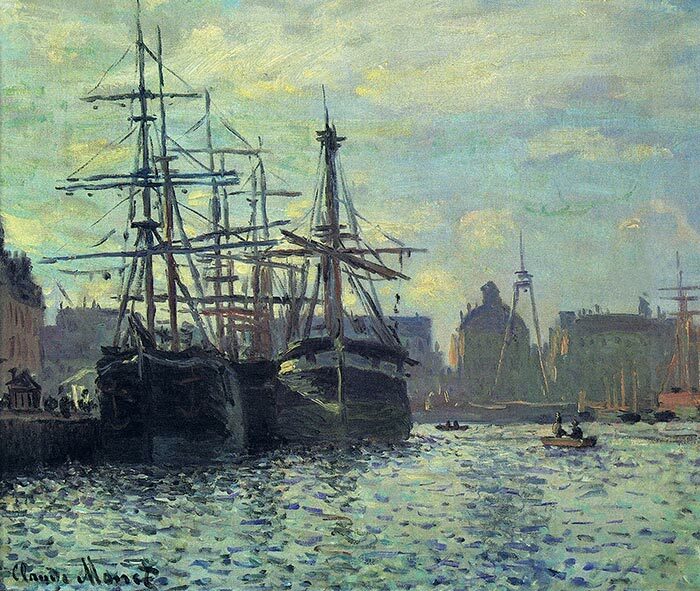 The brushwork is loose and fluent, as if Monet painted this without hesitation. There is a contrast between the thin paint used for the background and the thick, impasto paint used for bold accents (the boats, the sun and its reflection). Below is a close-up of the sky. To me, it looks like a build up of thin washes, with some vague details painted on top using (I assume) a wet on wet technique. 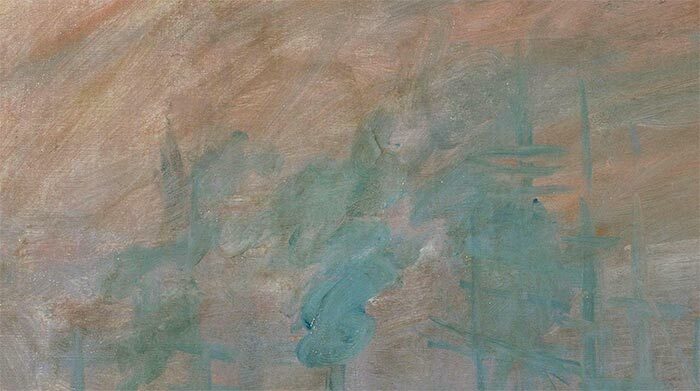 The dark green boat seems to have been painted with just a few bold strokes with a relatively large brush (you can see the individual brush marks in the close-up below). More aggressive brushwork was used for the sunrise reflection. Also, notice how sunrise reflection was not painted with a solid orange color. There are touches of unmixed white and various orange tones in there. This gives each stroke an interesting broken color effect. 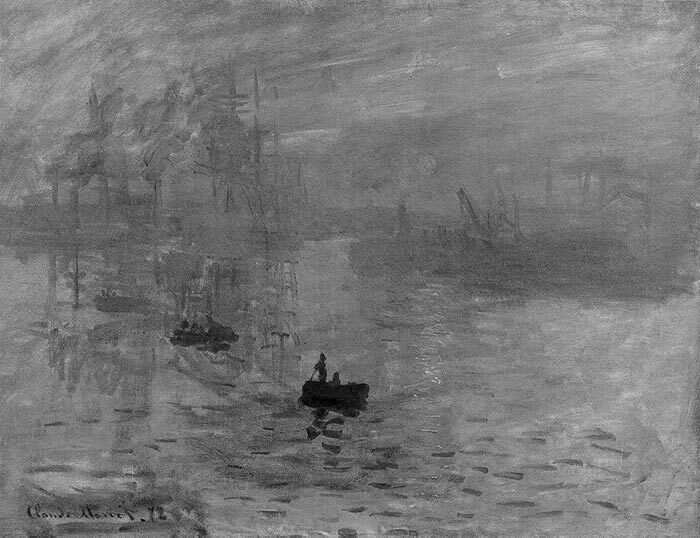 Monet used a similar technique at the bottom of the painting with the dashes of dark green. 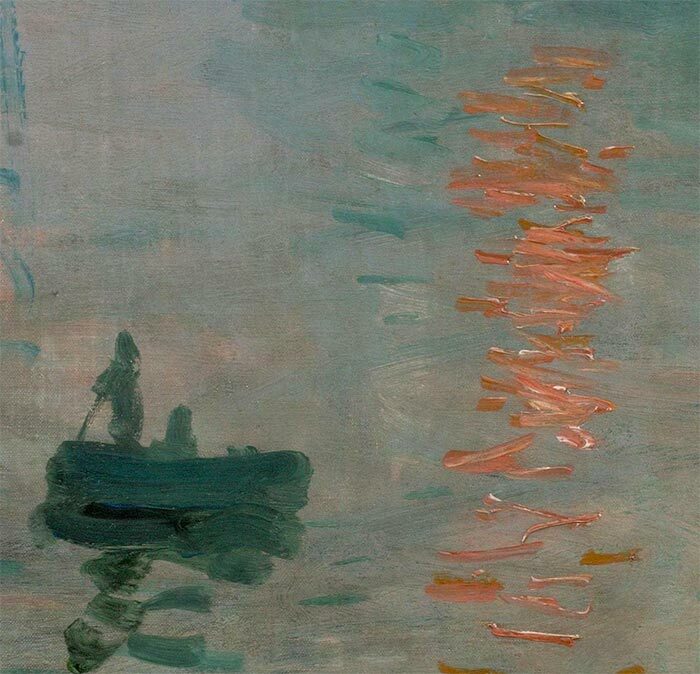 This suggests movement in the water and adds to the depth in the painting as they are only present in the foreground. The brushwork in the sky follows a downward curve which gives the painting a sense of movement and keeps your attention within the painting. Had Monet painted the sky with neat, horizontal brushwork, it would look much more static. The focal points are clearly the dark boats, the sunrise and its reflection. Everything else is really just there to create a sense of context and atmosphere. The focal points are positioned off-center around the middle. There is an interesting clash between light and dark where the sunrise reflection meets the dark green shadows. 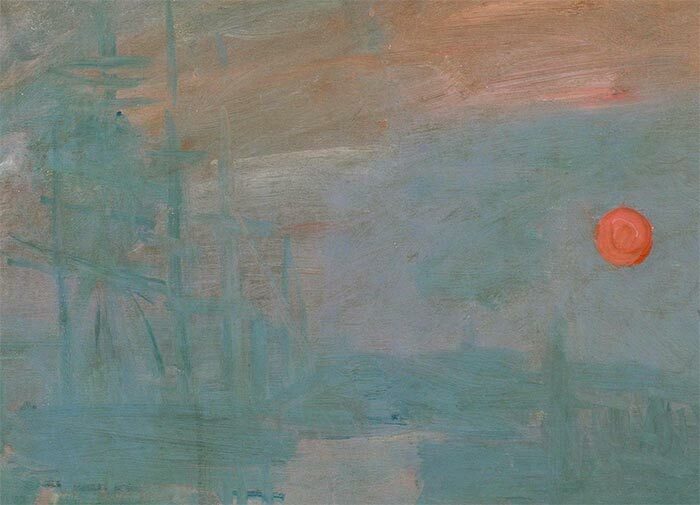 The sunrise reflection represents a strong verticle line in the painting, despite it being made up of short, horizontal dashes. The dark green shadows in the foreground are spaced out and as a whole, represent a loose horizontal line. The horizon line barely exists. There are just some buildings and faded blue shapes in the distance which suggest where land meets the sky. The horizon line is positioned slightly above center. Many artists avoid placing the horizon line directly in the center as it tends to appear unnatural. Depth is created by the gradual fading of objects as they recede into the distance. Also, the relatively cool colors used around the horizon line push that area back in perspective, whilst the warm colors used for the top of the sky come forward. Value (how light or dark a color is) is often taught as being the most important element of a color. But this painting by Monet demonstrates just how powerful saturation contrast can be (just look at the contrast between the orange sun and the dull, surrounding colors). If you want to draw attention to a particular area in your painting, then simplify the surrounding areas. In this painting, Monet draws your attention towards the vibrant oranges and dark greens, which stand out from the dull and simplified background. Your initial impression of a subject is a powerful thing. Learn to capture it by painting with instinct. I always try to start my paintings with loose brushwork to capture my first impression of the subject. I then refine from there if necessary. 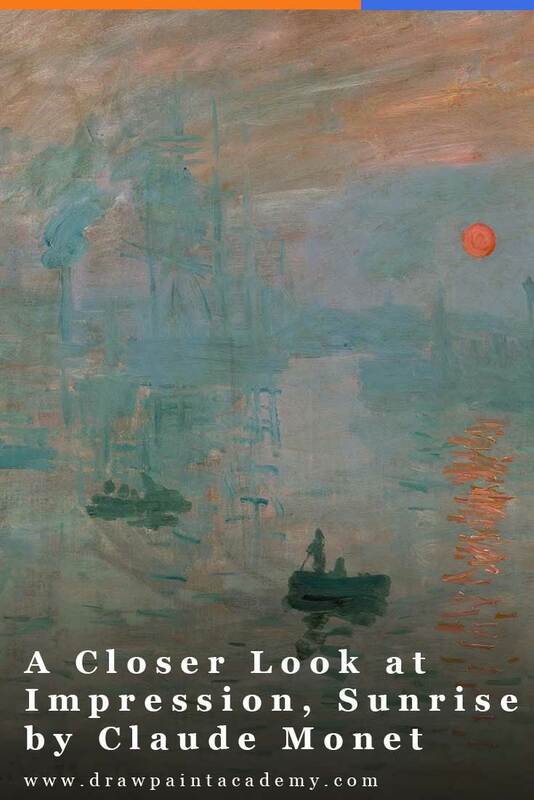 Thanks for reading and I hope you learned something new from Monet's Impression, Sunrise. If you have any questions or thoughts, please share in the comment section below. Thank you so much Dan! Saw the Monet documentary this afternoon. This post is certainly very timely! A nice breakdown of the components of this painting. Thank you. I love the way you break a painting down Dan, I am able to see and appreciate them differently as a result, and I always learn valuable information. Just one small question. The painting is of a sunrise I thought from the title. And yet you refer to the sunset. Is this a typo, or did I miss something? My comment is the same as that written by Chris in the above comments. I do love and enjoy your articles. Thank you very much. Thank you for this great analysis and painting tips. You are an exellent teacher. Seeing Monet ‘s work , inspires me to pick up my brushes. Beautifull paintings. Have an great day. Thank you for interesting information and teaching. You are grate teacher! I really enjoyed your insights on this painting! You have a great talent for breaking it all down, in concise way and easy (or easier) to understand. I’ve had some, but limited professional training in colors/hues/values, etc., but thoroughly “get” what you are saying. Thanks for breaking it down for us!